Find out how this couple paid off $200k, including their home. I am a big Dave Ramsey fan and I often listen to his show while I’m cooking dinner. 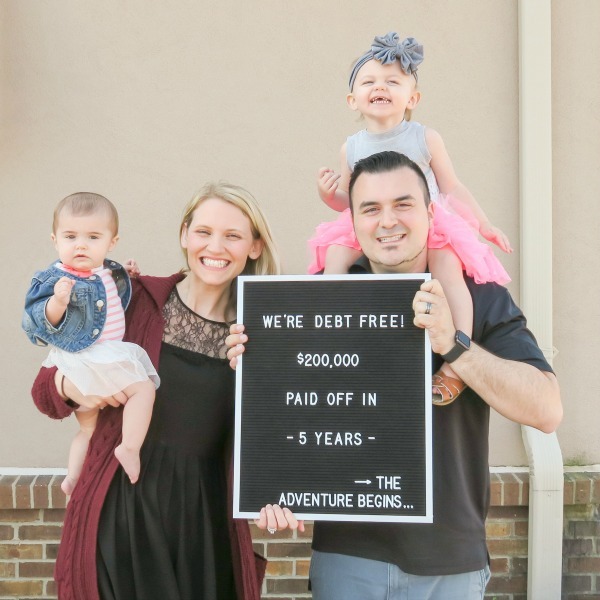 So I’m thrilled to bring you today’s story, because I actually watched this couple’s debt free scream when it was live on the show. Please welcome Drew & Farrah. They write a personal blog, Where Love Takes Us. We are from Cincinnati, OH. We have a family of 4. Drew 29, Farrah 27, Daisy 2, Scarlett 1. Drew works full time for Department of Defense. Farrah works part time for Department of Defense. Drew has a side website company and live event production called Ask Drew How. Farrah also has a kids t-shirt line that she runs out of the house called Lovely Littles Shop. We love church and missions work. We love to shoot photos and videos and focus on family and a healthy marriage. We obviously love Dave Ramsey and financial teachings so we help to teach those classes at our church one night a week. It’s been busy with the babies and so much work/income that hobbies lately have been sleeping (if we can) and traveling. Once we got married we realized we have great jobs and a great income, but where is all the money going? Bringing all our debt together was a wakeup moment and we said “this can’t keep happening”. We knew that we would make more money but we wanted to be able to buy a house with a conventional mortgage and we can’t come up with the down payment so we need to ratchet down. We looked around and saw people making 4x what we made, but they were upside down too… So we said there has to be a better way. Dave Ramsey FPU during our engagement. We didn’t apply it though until we were married and saw the mess we had made. Then we re-took the class and never looked back. We aren’t readers, we mainly listen to podcasts, and watch dave’s FPU and Legacy Journey. Making a budget and cutting expenses. Getting everything on paper. We made great money, it was just going down the drain. We made enough money 5 years ago to cover our expenses, so we weren’t in a negative earning situation. Once we got crap in order, we just kept finding ways to make more money. Promotions, new jobs, side work, selling stuff, etc etc… All the time we kept the same cost of living and just banked and smacked the debt in the face. If you look at our budget today vs 5 years ago when we started the journey: we have more than doubled our income, and expenses have slightly increased with the babies and some small luxuries. That’s how you smack debt… Be diligent at first, let God bless you, and keep the same lifestyle during the process. Its exponential. Working together, sharing the same goals and vision, talking about milestones. Making 100k but living on 50k. We set our budget and lifestyle at the beginning and it hasn’t changed much even with income doubling. Teaching FPU. It constantly encouraged us and reminded us of small things in Dave’s plan. Find stuff on the side of the road and sell it on craigslist or Facebook. Also sell cheap practical stuff at key times, example: for 3 years we sold glow necklaces at the local fireworks shows in our cities during July 4th weekend. We made a quick $1k every year. Don’t always have a GRAND idea or something that needs a big investment. Think smaller and profitable with little effort. What am I good at? We made a t-shirt company with a startup cost of $500. We won’t tell you what it had profited, but its done VERY well – it all started with a small idea that we could chew off and God blessed it. It was very mutual. We have a heart for missions and Kingdom. We agreed that if we are to live “different” we have to clean this up and let God do His thing in us. Broke people can’t spread the Gospel. It takes money and organization. We would keep our goals on paper on the fridge. We had little temperature gauges that tracked our debt. Nice visuals and monthly budget meetings kept us on track and accountable. Also, we did fun stuff that each of us wanted… That way is wasn’t too strict. Example, Farrah would want a pedicure. Well that’s not in the budget so you better sell something on craigslist… Lamp sold, go get a pedi now. LOL It was very fair rule based things. We knew that God controlled it all, and our misbehavior that BOTH of us did led us into the mess. Only working hard together will get us out of this. I also think that each of us having different personalities made us respect each other and our capabilities… Farrah is great at vision and milestones. Drew is good at executing and data and numbers. Farrah would say “lets buy new couches” or “I want the car payment done by October”. Drew would figure out the numbers and shuffle things around and brainstorm ways to make the money or sell something to get the goal accomplished. By the way, new couches feel good. And paid off cars drive a lot better and the steering wheel feels a lot better in your hand when you OWN IT. Equally, but Drew does the data part. Farrah casts broad vision like “I want a vacation in 6 months and it needs to be about $2k”. Drew hashes out how that will happen and the milestones to get there. We do a monthly budget. We talk about finances almost every day though because its who we are. We teach FPU, we lead friends and family. No we’re not “all about money” or “greedy”… We are what God wants us to be – Good Stewards with a laser focus. 1. We bought some stuff that we had been waiting to buy. We like to delay purchases and just be content. Its been part of our growing process. The first thing we bought was a new shower head. LOL–yeah its only $30, but it was the principle behind it. 2. We had a massive dinner and ordered soda! 3. We went to our bank and wrote the last check IN PERSON. Photos from that is on our blog. 4. A month later we went and saw Dave Ramsey and did our scream live on air. Watch their Debt Free Scream here! 6. We took a mini vacation to Florida. FINAL: We travel all the time for fun and work (budgeted of course) but next year we will cut it loose and do something insane like Europe. Contentment. Sleeping on purchases. Talking about everything with each other before buying. Not to “get my spouses approval”… its not like that at all…. its just to actually share an idea, a purchase, something that we need, maybe we know someone who has one for sale or for free. Drinking water when you eat out. We buy a beef for Christmas ever year as our gift to each other. We eat steak all year long (for a fairly good price). So we think thats a good christmas gift. And we order chicken when we eat out (because steak in restaurants isn’t as good as Drew’s grilling). Underbuying things that are temporary, lose value, and to test out. Overbuying things that have a good ROI and that we understand (ie. nice computers to do video design work and run the shirt company). Additional giving to missions work and local community. We ALWAYS tithed 10% and gave extra here and there when we felt like it during our debt journey. Now we have a totally different budget that will allow us to give like never before. Still looking for God to speak top us in this area. We believe 2017 will be the year for crazy things from God. Drew was the “spender” and used to buy tech toys, gadgets, etc. During the journey he nipped that in the bud. He will probably start that back up (cash flowed of course). Continue to teach FPU and share this Ramsey Gospel with anyone who wants to change their life and their marriage and family tree. GET IN DAVE RAMSEY’S CLASS IMMEDIATELY! Don’t look at your small income or your huge debt and say its impossible. The income is a shovel, the debt is a hole. Lets get digging and God will provide a bigger shovel. For more of Drew & Farrah’s story, check out their personal blog, Where Love Takes Us. Thank you Drew and Farrah for sharing your Debt Free Story. 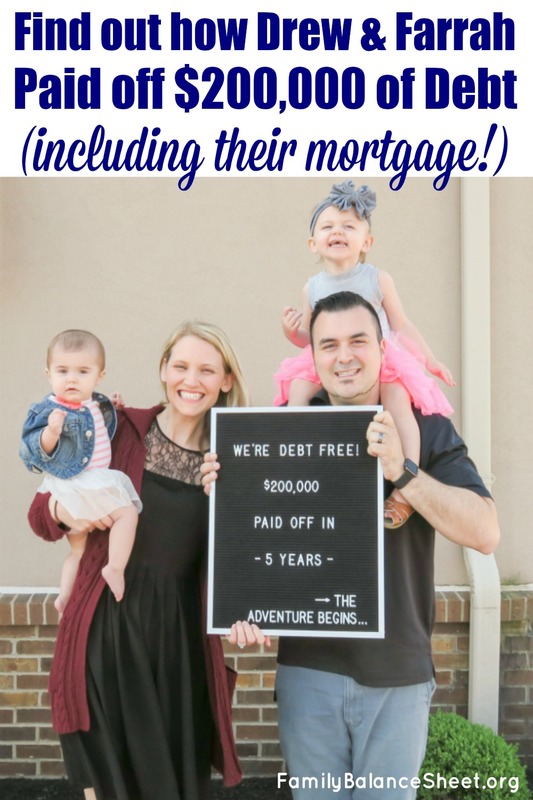 For more stories like theirs, go to Debt Free Stories. Thanks for featuring us! We hope this is encouraging to those who read it and watch our Debt Free Scream!